Endless sunshine and a desire to give back made for a fantastic day on the links this past Saturday in Kelowna. 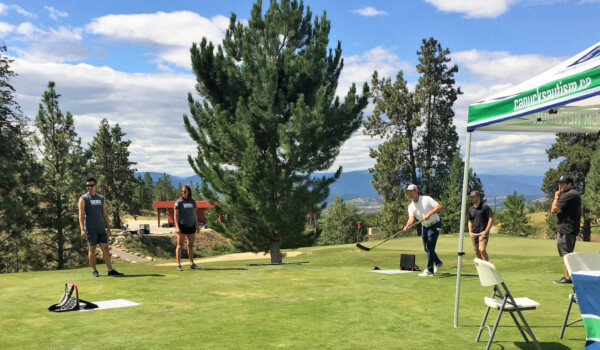 Presented by Scotiabank, over 100 golfers came out for the 17th Annual Kelowna Rockets Golf Tournament, raising vital funding for Canucks Autism Network (CAN) programs in the region. With an early afternoon start, participants had the exclusive opportunity to golf and dine alongside dozens of Kelowna Rockets alumni. The former WHL players in attendance included current NHL stars Shea Weber, Josh Gorges and Luke Schenn, among others. Stationed on the course at hole 16, we were on hand to provide golfers a fun break from the friendly competition. Given the hockey-themed flavor of the event, CAN staff challenged participants and Rockets alumni to a “saucer pass” contest. On their way to the next hole, golfers also had the opportunity to enter our WestJet Gift of Flight Raffle, while learning about CAN programs from our staff. Purchase your raffle tickets for WestJet’s Gift of Flight online now! Later that night at the event dinner, CAN’s Manager of Strategic Partnerships, Ryan Yao, shared more about the importance of the event to our efforts in Kelowna. On behalf of all our staff, volunteers and families at CAN, thank you to the organizers and participants of the 17th Annual Kelowna Rockets Alumni Golf Tournament. Because of you, hundreds of children, youth, young adults and families living with autism in Kelowna can learn new skills, develop friendships and make lifelong memories at CAN programs. Learn more about how you can help at canucksautism.ca/support!